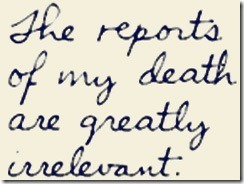 The demise of handwriting–is it on the wall? I’m an habitual journaler. I must have two dozen journals dating to the 70s. Within those covers are contained the details of my life. Not that I ever review them, but I know they are there in case I ever become “shut in”, I can relive my life from page to page without electricity. 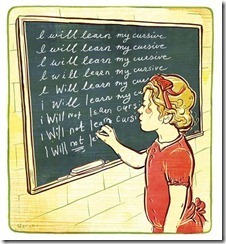 But now I hear some schools are no longer teaching cursive. 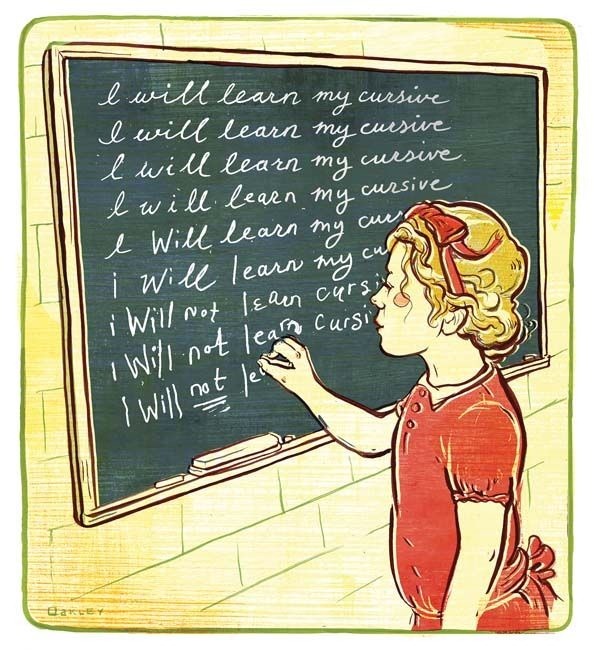 Since computers took over and text messaging and e-mail have replaced the written note, educators apparently feel cursive and handwriting in general is superfluous. But even those modern mediums are being replaced as we speak. The wall has replaced email, twitter has replaced the AP wire, google has replaced the encyclopedia, spell-check has replaced the dictionary, an e-card has replaced the Valentine. Wait a minute, not so fast. How do we sign documents, credit card slips and write a nasty note on that guy who blocked my drive way last night? All that remains for us to do now is to devolve to using the illiterates’ standby: a big X. All of us “kids” over a certain age recall our pride in being able to write our first paragraph in cursive. My penmanship has declined over the years, and I could probably stand a refresher course. But sadly, “long hand,” even printing with a Papermate has gone the way of the dinosaur and it hardly gets a passing notice. Some people claim that the physical act of handwriting stimulates creativity. I don’t know about that, but there’s something about a pencil waiting to be sharpened that excites me and makes me want to write a poem. But I couldn’t do that if I didn’t know how to write cursive. We probably won’t have pencil sharpeners any longer if it weren’t for lip liner. This entry was posted in Boomerang & the old gang and tagged The demise of cursive, The demise of handwriting by Emily Jones. Bookmark the permalink.